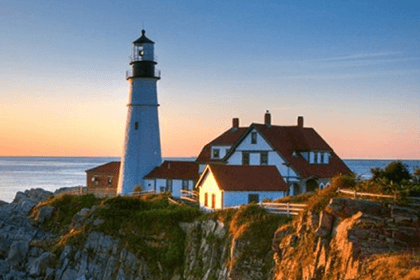 For over two centuries, Maine lighthouses have stood as beacons in the night along Maine’s rocky coast. They have also stood the test of time. Not only are these glowing citadels still providing protection for seafarers and their vessels; they offer safe harbor to visitors searching for an unforgettable experience. As spectacular as they are at night, they’re fantastic places to navigate in the daytime. 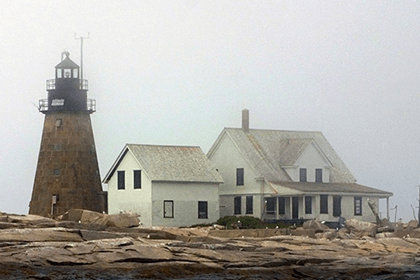 Among Maine’s 65 lighthouses, many are open to the public, some even offer access to keeper’s quarters. A good number have adjacent museums. All are photo- and paint-worthy – as discovered by a who’s who of American artists. Visitors can enjoy lighthouse tours on the water or in the comfort of your own car. Either way, you’ll be experiencing a brilliant example of the living legacy of Maritime Maine. Folks looking for a lighthouse binge are in luck each year in early September. That’s when the state offers Maine Open Lighthouse Day, a unique opportunity for the general public to explore more than twenty historic Maine lighthouses (many of which are only open on this day!). It’s an experience that will leave you with a happy glow the rest of the year. Maine has 3,478 miles of coastline. Not as the crow flies, but as the sandpiper scampers. With so much territory to stand watch on, you’ll find lighthouses in nooks and crannies up and down the coast. 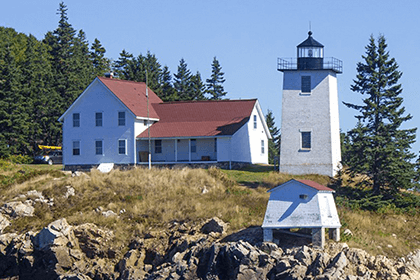 To help focus your search – without a spyglass – here are some of Maine’s most popular lighthouses by region. 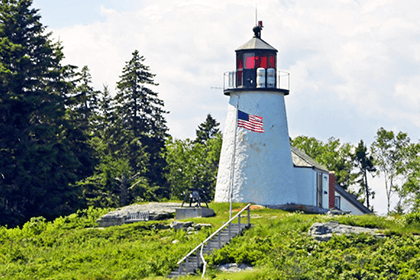 The Portland Head Light in Cape Elizabeth is the oldest lighthouse in Maine and is adjacent to 90-acre Fort Williams Park and its great ocean views and recreation. Fort Williams Park has nice walking trails, gardens and a children's garden area. The former keepers' house is now home to The Museum at Portland Head Light. 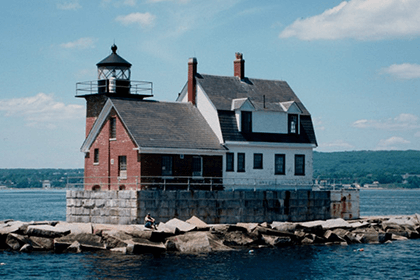 Just two miles north of Portland Head is Spring Point Ledge Lighthouse standing atop a 900-foot granite breakwater, with a view of the entire Portland skyline across the waves. 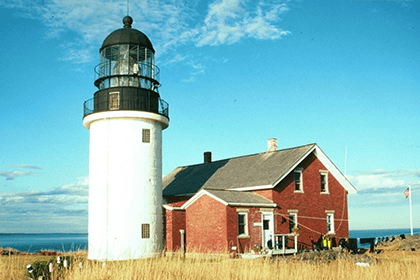 At Cape Elizabeth Light, also known as "Two Lights," the eastern tower is still active and the western tower, while not publically accessible, still stands tall and proud. And then there’s the cute one, Portland Breakwater Lighthouse. 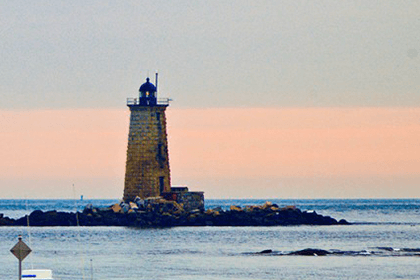 It’s known, affectionately, as Bug Light because it’s short and as cute as a – well, you know. Diminutive though it may be, Bug’s Light played a huge role in protecting Portland Harbor beginning with its construction in 1875. 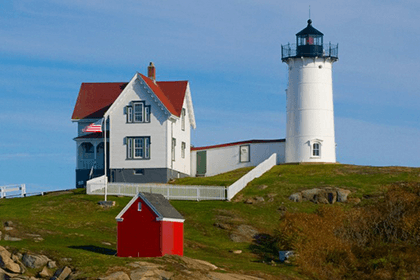 A visit to Pemaquid Point in Bristol includes the Fisherman’s Museum and Pemaquid Art Gallery. 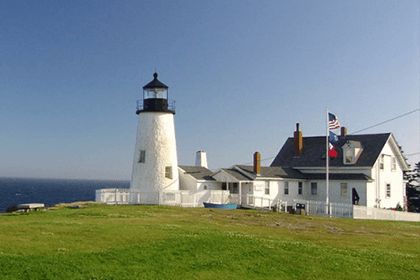 If it wasn’t already iconic enough, Pemaquid Point Lighthouse is featured on the tails-side of Maine’s U.S. quarter. Visitors to Seguin Island Lighthouse can take a trip back in time, way back. The lighthouse was ordered by President George Washington in 1795. Learn more about the history at the island museum, and get the inside story with a keeper-guided tour of the tower. Another guided tour awaits at Burnt Island Lighthouse, where guides are dressed in period clothing to portray a keeper family from yesteryear. You can take a boat to the island with a captain who might have a story from yesteryear too. When you look up Owl’s Head Lighthouse in Rockland, you really will be looking up. The tower sits on a rocky rise 100 feet above Penobscot Bay. The cylindrical tower itself is on the short side at 30 feet, but its light delivers a 16-mile beam. 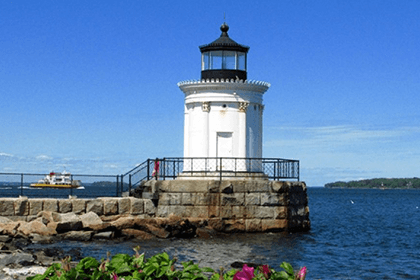 While you’re in the area, visit the Maine Lighthouse Museum in Rockland. You’ll leave enlightened in lighthouse history, lifesaving and the U.S. Coast Guard. 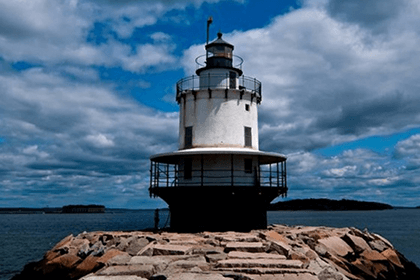 If you like a little exercise with your lighthouse, take a refreshing stroll to the Rockland Breakwater Lighthouse, shining brightly at the end of a nearly mile-long breakwater with sparkling views of Rockland. For a movie moment, visit Marshall Point Lighthouse. The lighthouse and its long runway served as the picturesque endpoint where Forrest Gump completed the eastbound leg of his famous cross-country run. One lighthouse you don’t want to miss is on a rocky island off historic York. Why? With its fantastic setting and beautiful light, Cape Neddick is one of the most painted and photographed lighthouses on the planet. 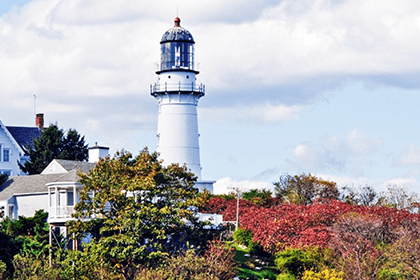 Recalling one of the planet’s most majestic creatures, Whaleback Lighthouse is located in Kittery only 1,500 feet from the Maine-New Hampshire border. Majestic as it is, Whaleback is only accessible by water. Which is the only way whales can visit too. Have you ever heard of Cape Porpoise Harbor? Goat Island Light Station can shed some prestigious light on that. 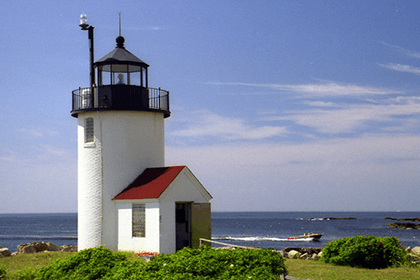 The lighthouse and the harbor it illuminates are located near Kennebunkport and the compound of the late 41st President of the United States, George H.W. Bush. 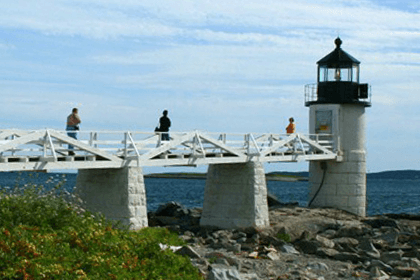 Wood Island Lighthouse is located on an uninhabited 32-acre island off the coast of Biddeford. In July and August, special tours are offered that allow visitors to view the interior and learn about the lifestyle of the keepers. It’s also open on Maine Lighthouse Day each September. 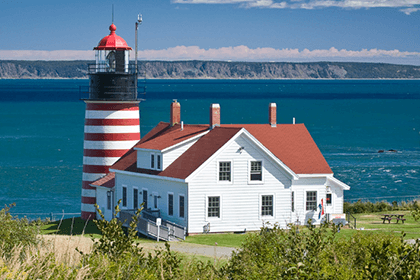 The focal point of West Quoddy State Park in Lubec, and the easternmost location in the continental U.S., the lighthouse was commissioned by President Thomas Jefferson in 1808 and is further distinguished by its candy-striped tower. Built in 1872, the lighthouse marks the entrance to Burnt Coat Harbor, Swan Island's main port. Swan's Island can be reached by ferry from Bass Harbor on Mt. Desert Island. Tours offer views from the water. 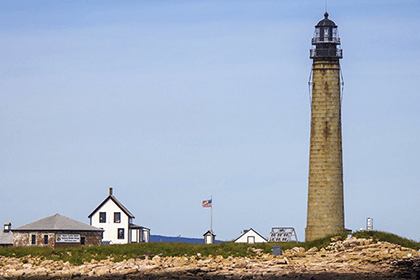 At 123 feet, the lighthouse on Petit Island is one of Maine’s tallest. It’s also among the oldest, established in 1817. Today the island is part of the Maine Coastal Islands National Wildlife Refuge. A boat tour is the best way to view the lighthouse – and the Atlantic Puffins who sometimes drop by. And since every lightshow needs a dramatic ending, we present Mount Desert Rock Lighthouse, described as Maine’s most dramatic and isolated lighthouse. Perched on a rocky islet only 600 yards wide and 200 yards long, it’s viewable by water – or drone camera for dramatic effect. 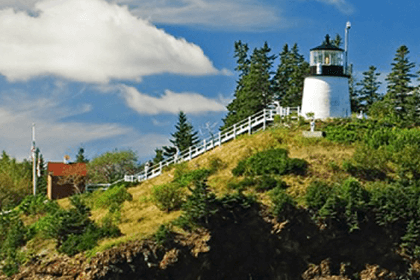 If a visit and tour aren’t enough to satisfy your lighthouse longing, you’re in luck. 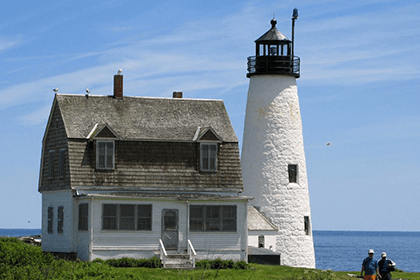 There are several Maine lighthouses that give you the opportunity to actually stay in a lighthouse. Think of it as the ultimate sleepover, with the ultimate nightlight. Lighthouse accommodations are popular, so be sure to plan ahead and book early!